Do you spend a lot of time baking and cooking? Anyone who has known me knows I love to cook. As odd as it sounds, I just don't like going out to eat. Why spend big money on meals when you can make something healthier and tastes better at home? One of the areas that really bothers me about eating out is the grease in food. I rarely eat fried food and when I do, I don't use a deep fryer – I do the old fashion cooking in a wok or deep frying pan, and use healthier oils. In my household, there are really only two oils I use for this sort of cooking – virgin olive oil and coconut oil. I love that both of these oils are fairly healthy and not filled with trans fats or animal fat (several times I've converted old family recipes relying on lard!). Over the past few days, I have had quite a bit of fun testing Tropical Traditions Gold Label Virgin Coconut Oil. Since I normally buy my coconut oil at Trader Joe's, I was curious how this compared to my normal oil and if this specially made coconut oil truly was worth it! For those who haven't heard of Tropical Traditions, they are one of the most well recognized companies in the United States who sell all-natural coconut oil. In 2001, they were the first to export traditionally made coconut oil from the Philippians. The owners, Brian & Marianita Shilhavy, began their adventure with coconut oil back when the owners still lived in the Philippines and were looking for coconut oil that wasn't refined. Having grown up on a coconut plantation, Marianita discussed the old, traditional way of making coconut oil, where the coconuts were selected and pressed by hand, leaving a pure and unrefined oil. After renovating her old family farm and hiring other local families, they began producing this traditional coconut that quickly became a hit in the Philippines and eventually, the United States. Today, Tropical Traditions is one of the most well known coconut oil companies in the United States, and is distinguished as one of the few that makes USDA certified organic coconut oil. 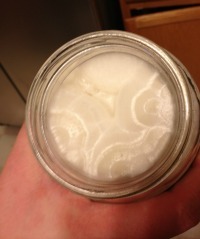 One of the things I love about coconut oil is that it is just so easy to use. Out of the containers, the Tropical Traditions Gold Label Virgin Coconut Oil is white, creamy, and a bit shiny. From what I have seen over the years, high quality coconut oil seem to have more of that beautiful shine to it. While I am unsure why it does this, I have a feeling it has to do with the quality of the coconuts used to make the oil, as well as the method used to make the coconut oil. 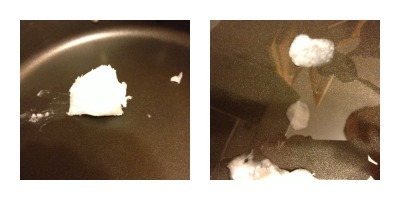 As you can see from the picture, solid coconut oil is actually fairly pretty. As for cooking with coconut oil, it is one of the areas where you have to be truly careful. Just like most coconut oils, Tropical Traditions Gold Label Virgin Coconut Oil does not take long to melt since coconut oil has a very low melting point. This means that if you leave it in a room over 75 degrees, the coconut oil in the container will start to soften or liquify. For cooking, this is awesome since it means you get more done at lower temperatures and can get cooking quickly. Just remember too that there is a catch – with it melting faster, it also means that it gets hot fast. As a rule of thumb, never leave a pan with Tropical Traditions Gold Label Virgin Coconut Oil unattended – coconut oil in general has a lower temperature at which it can catch fire than other oils. If I had to choose one area where Tropical Traditions Gold Label Virgin Coconut Oil stands above it's competition – it's flavor. Most coconut oils on the market barely have any flavor at all. From what I know, this is due to it being heavily refined and processed in a factory. With Tropical Traditions coconut oil, your food still has a very subtle coconut taste that is absolutely amazing. 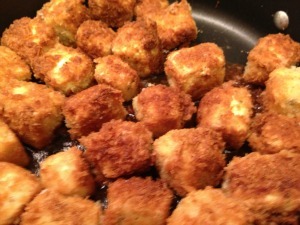 My first time making this recipe, I tested it with my Fried Coconut Flavored Tofu Recipe. Was this coconut oil, it had a very nice coconut flavor that made the tofu even more amazing! While I haven't tried with other recipes just yet, I can hardly wait to start experimenting with this coconut oil to see how it flavors some of my other recipes! Having used coconut oil for some time, I have to say I was pleasantly surprised with Tropical Traditions Gold Label Virgin Coconut Oil. When I first got this oil, I expected it to be just like every other brand of coconut oil on the market. Instead, I got a high quality oil that left my food tasting non-greasy and with a very subtle coconut flavor. I can easily see myself spending the extra money to get this oil – especially with the great flavor it ads to some of my favorite dishes. As for my product grading, I give their virgin coconut oil an A rating. Want to know where you can purchase Tropical Traditions Gold Label Virgin Coconut Oil? It is currently for sale on the Tropical Traditions website. For this review, I was able to try out their one quart organic coconut oil, which was also on sale at the time of this review. Also, don't forget that your first time ordering you will also receive a free book on Virgin Coconut Oil. To learn more about Tropical Traditional coconut oil, feel free to check out their website to see their latest sales and all the other great coconut products sold on their website. Disclosure: Budget Earth did not receive monetary compensation for this review, but did receive a free quart bottle Tropical Traditions Gold Label Virgin Coconut Oil for review purposes via Tomoson.com & Tropical Traditions. All of the opinions on this blog are the opinions of said author and these opinions may differ from your own. As always, these opinions are completely our own and we are under no obligation to write a positive review. Links in this article may include affiliate links, where Budget Earth receives a discount coupon for referring you. I love the smell of coconut oil! That fried coconut tofu looks GREAT! I am vegetarian, so that is right up my alley 🙂 You've just inspired me! I love their coconut oil, the recipe looks good. Thank you for sharing. Thanks Susan! I have seen coconut oil in stores & online but I really didn't know if you could use it just like other oils. It's great to know that this oil has a great taste to it too! Your fried tofu looks really good! I have coconut oil at home right now and haven't tried it yet. Thanks for the tips in your post – I had no idea that it would cook faster, so I now know when I try a recipe with it to be prepared or that. I haven't decided what to try first. My nephew LOVES tofu, so I may try your recipe as a treat for him. Great post. I've been hearing a lot about Coconut Oil these days. I think I need to learn some more! I have never tried cooking with coconut oil! I am really excited to try this out, I love that fact that even though you fried your food, it wasn't greasy!